A recent study found that dog owners live longer, healthier lives. Dogs help cut cardiovascular risk in their owners by both offering companionship and a reason to exercise, according to researchers at Uppsala University in Sweden. Dogs, in sum, prompt their owners to go for a lot of walks. Eric O’Grey is living proof of those findings. 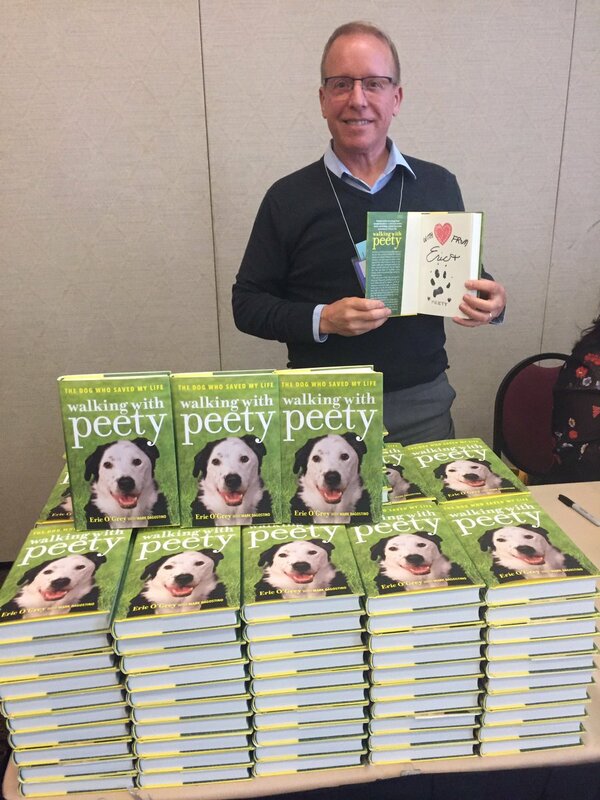 In Walking with Peety, the Dog Who Saved My Life, O’Grey recounts how his went from a solemn 340 pounds, suffered Type 2 diabetes, high blood pressure and cholesterol. His doctor told him to overhaul his diet and get a dog. He soon dumped weight, dropping to 180 pounds, and reversed his litany of illnesses. He credits his at least twice-daily walks with his dog. Even former U.S. President Bill Clinton took notice. He lauded O’Grey’s healthy lifestyle and pet ownership, urging people to adopt, not shop. • Small interventions and taking the first step can make a big difference in individual health. • A pet’s love can change everything! For O’Grey, Clinton was also his inspiration to turn his life around. And his love for Peety abundantly clear. O’Grey, who lives in Boise, Idaho, considered Peety his best friend. But he found the courage to love again. O’Grey adopted Jake, a Labrador retriever mix. “Jake turned out to be the best running partner I could have hoped for, and like Peety, now travels with me almost everywhere,” O’Grey says.